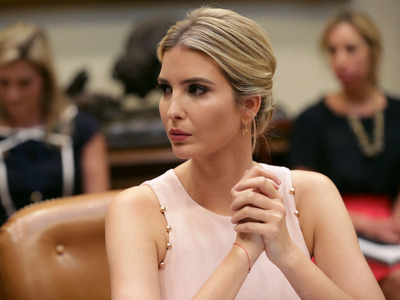 Chip Somodevilla/Getty ImagesAssistant to the President and Donald Trump’s daughter Ivanka Trump hosts a listening session with military spouses in the Roosevelt Room at the White House August 2, 2017 in Washington, DC. A former adviser to Donald Trump said in 2015 that he once arranged for Ivanka Trump to sit in Vladimir Putin’s chair in the Russian president’s office in the Kremlin. The claim came in an email from Felix Sater, a Russian-born businessman who urged the Trump Organisation to pursue a real-estate deal in Moscow that he said could help Trump, then a presidential candidate, win the election. The first line of the email, which was obtained by The New York Times and published on Monday, alludes to a trip to Moscow that two of Trump’s children, Ivanka Trump and Donald Trump Jr., took in 2006. “I arranged for Ivanka to sit in Putins private chair at his desk and office in the Kremlin,” Sater wrote to President Trump’s lawyer, Michael Cohen, in November 2015. The boast was followed by an assurance that Sater could get Putin to “buy in” to the real-estate deal and that it would help Trump’s candidacy. She said that during the 2006 trip, she took “a brief tour of Red Square and the Kremlin,” the Times reported. But the possibility of a trip to Putin’s office would suggest a much closer relationship to Moscow than the Trumps have previously suggested. And it would provide a new lead for Robert Mueller, the special counsel heading the investigation into the Trump campaign’s possible collusion with Russia in the US presidential election. President Trump said later in 2015 that he was “not that familiar” with Sater. According to the Times, the Trump Organisation turned over the email, along with other correspondences between Sater and Cohen, to the House Intelligence Committee, which is also investigating the Trump campaign’s relationship with Russia.